J. hasn't connected with their friends on Goodreads, yet. J. Anderson Coats is the award-winning author of books for kids of all ages. She's received two Junior Library Guild awards and earned starred reviews from Kirkus, School Library Journal, the Horn Book Review, and Shelf Awareness. Her newest book is R is for Rebel, middle-grade novel about coercion and resistance in a reform school in a fictional occupied country. The Wicked and the Just was one of Kirkus Reviews' Best Teen Books of 2012 and won the Washington State Book Award for Young Adults. She is also the author of The Many Reflections of Miss Jane Deming, a middle-grade novel set in Washington Territory in the 1860s which was a 2017 Junior Library Guild selection and one of Kirkus’s Best Historical Middle-Grade Books of 2017. Her shor J. Anderson Coats is the award-winning author of books for kids of all ages. She's received two Junior Library Guild awards and earned starred reviews from Kirkus, School Library Journal, the Horn Book Review, and Shelf Awareness. Her newest book is R is for Rebel, middle-grade novel about coercion and resistance in a reform school in a fictional occupied country. The Wicked and the Just was one of Kirkus Reviews' Best Teen Books of 2012 and won the Washington State Book Award for Young Adults. She is also the author of The Many Reflections of Miss Jane Deming, a middle-grade novel set in Washington Territory in the 1860s which was a 2017 Junior Library Guild selection and one of Kirkus’s Best Historical Middle-Grade Books of 2017. Her short story, “Mother Carey’s Table,” appeared in A Tyranny of Petticoats: 15 Stories of Belles, Bank Robbers, and Other Badass Girls (Candlewick, 2016). 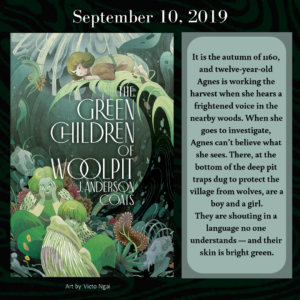 The Green Children of Woolpit has an official release date – it’s coming your way on September 10th, 2019! Which books should we read July 2013? Book should be pubbed between 1/1/12 and 6/30/12. Write-ins welcome but CHECK the list first, please!